Growing up in Kochi, I had Gujarathi neighbors. Even today some of my favorite food items are from Gujarat. Snacks like kandvi, handvo are famous. Dhokla one of my favourites is made traditionally using fermented batter of rice, chana dal, urad dal. 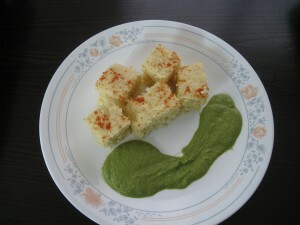 Here is an instant version of Dhokla with besan and rawa. Serve with corriander chutney. 1&1/2 teaspoon fruit salt (ENO) plus 1 tablespoon water to aerate. 1. Mix all the ingredients from Besan through water to make batter. Let the batter sit for 10 to 15 minutes. 2. After 10 minutes add fruit salt. Pour 1 tablespoon water on top of the fruit salt to aerate. Stir the batter in one direction untill fluffy. 3. Pour the batter into a greased flat dish; tap the dish to spread the batter, sprinkle red chilly powder and steam for 10 minutes on high flame. 4. Lower the flame and steam for another 10 minutes. 5. Cool the steamed Dhokla to room temperature, cut to pieces and keep aside for tempering. 6. For tempering heat oil, add mustard. When mustard crackles, add chana dal, urad dal, curry leaves and sesame seeds. Pour water into this tempering mixture and pour it on top of the dhokla. 7. Garnish with corriander and grated coconut.